I have a confession to make: we’re one week into December with no tree up yet. We have a balsam fir wreath on the front door thanks to a brother and sister-in-law in Maine and we’ve had Christmas music playing since December first. I’ve bought exactly two presents so far with two that I already need to return, which puts me at net zero. The other day, Annalise asked me to please bake something. Sure, I answered, and asked her what she wanted, thinking she had some particular craving. “Just bake,” she answered. “Just bake anything.” Oh, sweet girl. I smiled inside because she was so spot on – this single mom chapter of life has me doing so many things with little time for the baking I used to do. Our neighbors have had trees and lights up since Thanksgiving weekend. A scroll through Instagram shows friends with kids in Christmas jammies and Advent traditions well under way. I could start to feel very behind on Christmas. I need to get a tree up and decorated, stockings hung, Christmas dishes set out. I need one big shopping day as soon as I finish my one big shopping list. I have cards to create, order, address and mail, friend gifts to put together and a few parties to get ready for. Years past, as soon as the Thanksgiving dishes were washed and put away, I was planning my early Friday morning shopping route. From that point until I fell into bed on December 25 eve, I felt on go. I was driven by my own expectations to make everything just so and to get everything just right. 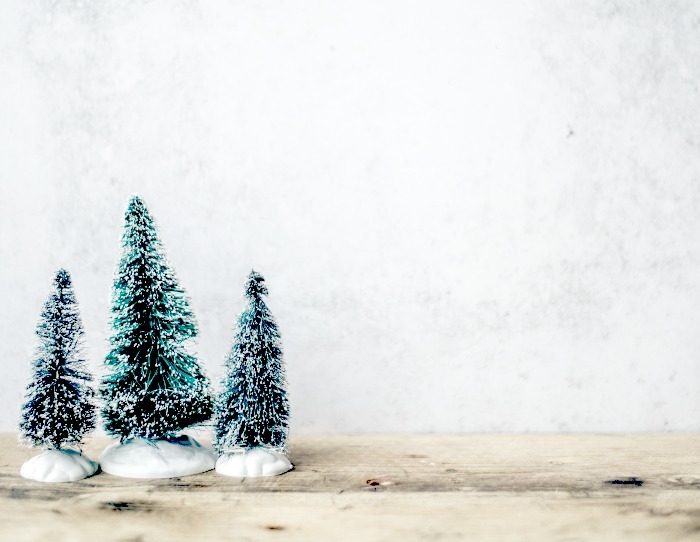 Maybe it’s because I’m older and I’ve learned – I can rest in an imperfect Christmas. No amount of planning or expectations or execution can make Christmas perfect. In fact, it’s the imperfect Christmases I remember most. One year, as a young mom, I was hosting a houseful of Dan’s family. We were in a newly renovated house gathering for the first time around my great-grandmother’s handed-down dining room table. I’d stayed up late and gotten up early to prep a memorable Christmas dinner and boy was it memorable. About 20 minutes into the meal, I sipped my iced tea — only to find it tasted like dish soap! Earlier that day, I’d seen more foam than usual as I sprayed cold water into the iced tea pitcher. But I was a woman putting on Christmas so I’d ladled off the extra suds and filled every glass. Another year, we got hit with the flu. We had four kids five and under and our first clue something was amiss was when 3-year-old Rachel got up from opening presents to put herself back to bed. By day’s end, most of us were down with it. That Christmas weekend, we slept and hung out in jammies, an unexpected respite from the rest of the holiday noise and busyness. Then there was our first Christmas after Dan died. Our hearts were split wide open and I dreaded doing Christmas without him. Knowing we needed to get away, family left us their mountain home. We walked into a house straight from a Hallmark Christmas movie. Right in the midst of our gut-wrenching grief, God surprised us with his goodness, tucking the eight of us high in the Virginia mountains. Josh Groban played on repeat over stereo speakers, we carved our first Turducken and woke to a blanket of white snow on Christmas morning. Nothing we can do will make Christmas perfect. We can’t produce it and we can’t perform it. Christmas is something God has done for us, not something we put on for others. Because right into our imperfect, God came to dwell. Among imperfect people, God lived and taught and healed and loved. Because of our very imperfection, God pierced time and heaven to redeem us. Ours is not to create a perfect Christmas but to worship our perfect Savior. Surely Mary and Joseph knew something about best laid plan’s gone awry. I wonder whether Mary set aside her girlhood dreams of the perfect wedding for a quick and quiet ceremony with Joseph. And then, expecting their first child, they had to leave family and the familiar to travel to an overcrowded and overbooked Bethlehem. Instead of a nursery and crib handmade by Joseph, they laid Jesus in a wooden feeding trough lined with handfuls of sweet hay. Rejoice in the perfect Gift who’s been given. Jesus makes Christmas perfect so we don’t have to. 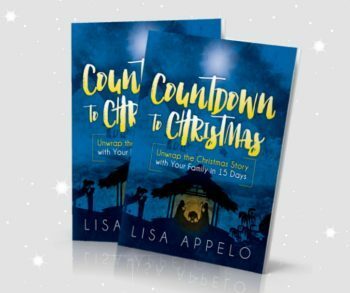 Bring the story of Jesus’ birth to light in an easy, hands-on way with the family Advent devotion Countdown to Christmas. Build your Nativity one piece each day for 15 days along with scripture, a daily reading and prayer to unwrap the real Christmas story with your family. *affiliate links are included never at any extra cost to you. See my full disclosure here. Yay, I’m not the only one who hasn’t put the tree up! I”m not alone! I’m not even sure when we will be able to get our tree. I’m trying to figure out how to add the Christmas errands to my already busy to-do list. The busy season is sure a test for me to see if I can allow Jesus to rule my heart with His peace—which is what Christmas is about. I agree that those imperfect holidays are often the ones we remember most. They are! Praying we both have warm, peaceful homes that honor our Savior. Imperfect is what we seem to remember most, isn’t it? Jesus‘ birth is certainly surrounded by the seemingly imperfect scenario, yet perfection came from it. May He use our imperfect scenarios to weave His perfection throughout them. Thanks for sharing your stories, Lisa. I smiled at many of them and grabbed my heart a little bit as well. May your Christmas, whether it includes a Christmas tree, baked goods, Christmas cards, or not… Be simply Savior-full. Love you! That’s it, Kristi. Perfect will and perfect Savior in what must have felt like a less than perfect circumstance. Merry Christmas! That dish soap story reminds me of my year of hockey puck dinner rolls! But yes, it’s so important not to let Christmas make us miss Christ. This post really warmed my heart. It hasn’t seemed so Christmas-y with our move (plus first December solo until kids come home). But Jesus? He’s still right here with me. And with you, my friend. Oh goodness! We can laugh now…and be thankful always for Jesus. Thank you, Lisa. The first year I made my families traditional yeast rolls for my first Christmas with my husband’s family, I killed the yeast. My sister-in-law dubbed them flats. Thirty-four years later they are still flats. Even though I have learned to make them properly. 🙂 I am so grateful for a God who shows us how to laugh at our own imperfections.